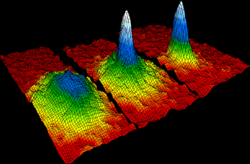 Bose-Einstein condensate - representative image of thermal physics. Thermal physics is the combined study of thermodynamics, statistical mechanics, and kinetic theory. This umbrella-subject is typically designed for physics students and functions to provide a general introduction to each of three core heat-related subjects. Other authors, however, define thermal physics loosely as a summation of only thermodynamics and statistical mechanics. Thermal physics, generally speaking, is the study of the statistical nature of physical systems from an energetic perspective. Starting with the basics of heat and temperature, thermal physics analyzes the first law of thermodynamics and second law of thermodynamics from the statistical perspective, in terms of the number of microstates corresponding to a given macrostate. In addition, the concept of entropy is studied via quantum theory. A central topic in thermal physics is the canonical probability distribution. The electromagnetic nature of photons and phonons are studied which show that the oscillations of electromagnetic fields and of crystal lattices have much in common. Waves form a basis for both, provided one incorporates quantum theory. Other topics studied in thermal physics include: chemical potential, the quantum nature of an ideal gas, i.e. in terms of fermions and bosons, Bose-Einstein condensation, Gibbs free energy, Helmholtz free energy, chemical equilibrium, phase equilibrium, the equipartition theorem, entropy at absolute zero, and transport processes as mean free path, viscosity, and conduction. There are two types of thermodynamic instruments, the meter and the reservoir. A thermodynamic meter is any device which measures any parameter of a thermodynamic system. In some cases, the thermodynamic parameter is actually defined in terms of an idealized measuring instrument. For example, the zeroth law states that if two bodies are in thermodynamic equilibrium with a third body, they are also in thermodynamic equilibrium with each other. This principle, as noted by James Maxwell in 1872, asserts that it is possible to measure temperature. An idealized thermometer is a sample of an ideal gas at constant pressure. A thermodynamic reservoir is a system which is so large that it does not appreciably alter its state parameters when brought into contact with the test system. ↑ Chang Lee, Joon (2001). Thermal Physics – Entropy and Free Energies. World Scientific. ISBN 9810248741.